Most of us wish to have prosperity and happiness around us. When we develop the spirit of enthusiasm, love, and compassion within us, others also start getting accustomed to them. This is the easiest way. Natural paintings such as beach art prints and other pastel wall arts, surround us, can help a lot to develop such positive feelings within us. So, it is good to install them in your bedroom, corridor, kitchen, drawing room and other living areas of your home. Natural scenery: Scenes of natural sceneries and celebrations bring good energy as they represent prosperity. You can hang the paintings of them at any place of your living areas where they can be seen easily. Porcelain jar: Porcelain jar symbolizes happiness and is usually given as a wedding gift to a married couple. You can hang its painting in a coveted southwest corner of your bedroom or living room. Cherry blossoms: Cherry blossoms are the feng shui symbol of health as well as romantic love. Its artwork can be placed in the east corner of your bedroom. Colorful pears: Pears are the symbol of immortality. They are a brilliant representation of longevity and health. You can set its image in the east corner of your bedroom. A pair of the swan: a pair of the swan is the symbol of marital fidelity as well as bliss. You can choose a painting of them without water. By having it in your bedroom, you can invite swan luck into your love life. A sailboat: If you dream to own a sailboat, you can add an image of wall art of boats on the water in your house. Keep it at a place in your house or office where you can have a direct look of it. 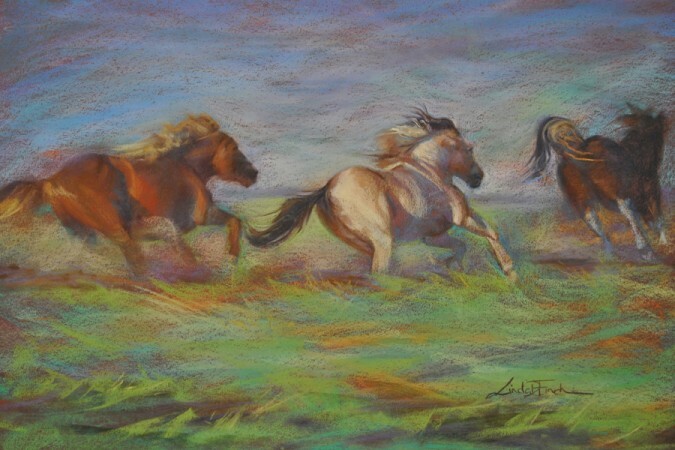 Horses of different colors: Among animal art prints, a painting of horses of different colors can bring good luck in your life. You can hang it in your drawing room or bedroom. Lovebirds: Lovebirds are considered as the messengers from the god of marriage. They are one of the best symbols of marital love. Display the image of lovebirds in a pair in the southwest corner of your bedroom. Flowers of different varieties: Flowers symbolizes prosperity, love, happiness, hope, and life. You can hang a painting of flowers of different varieties in your living room. Beautiful birds: Birds are considered to be the symbol of freedom, hope, and peace. You can choose images of birds among wall arts of animals of different varieties and can hang them in your corridor or hall. Mandarin ducks: They are the symbols of marriage and love. A pair of them can be placed on a bedside table. It is good if you display them without water. Keep your home and office free of unnecessary things as a cluttered space does not attract the energy of wealth. Just note down in a notebook the things you require and save 30 minutes in a day to remove the needless clutter from your house or office. It is important to take a good care of the money area of your house and office. As this is the place where you manage finances and other work, it is good to include here the paintings such as lakes and green fields that symbolize prosperity. You can also use plants and mirrors as they also represent this feature. Which types of images do not bring good luck? Avoid sad, dark, ill-colored and violent images as they can not give you the energy of health, vibrant living, and love. Always add images that can give you inspiration and enthusiasm. Conclusion: The above-mentioned paintings tell us, life is full of colors and beauty. They are the source of all good qualities and positive energy. Whenever we come close to them, they support us like a true friend and inspire us to enjoy every single moment of life to its full extent.